In this series, I explore the concepts of value and worth through creating pieces that fall apart over time. The inspiration for this series came from the experience of holiday shopping. The decorative materials used for wrapping and decorating gifts are attractive. However, after we tear open the wrapping paper to see what was hidden inside, the decorative materials are no longer valuable but what was inside the box becomes valuable to us. The wrapping paper and ribbons end up in the trash. I am particularly interested in the shift of value over such a short amount of time. In the Glam Globe series, I use decorative holiday materials, including wrapping paper and Christmas ornaments by wrapping each of the numerous layers in Saran Wrap on a structured frame. 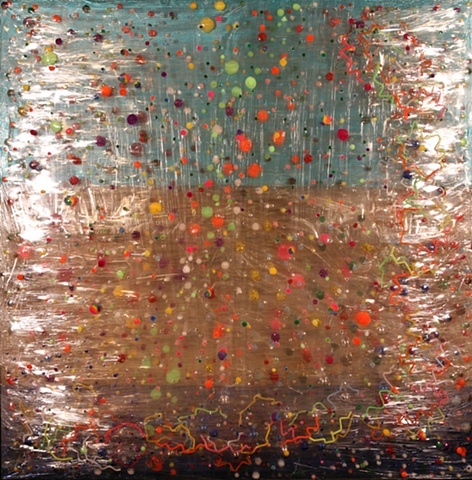 Each element is attached with impermanent glue and because of the instability of Saran Wrap and glue, the work will change and fall apart during the duration of the exhibition. Although the compounds of this piece are still the same, its value has changed. The work illustrates that value is dependent upon our perception.